We came in third at 31.1%. After retail sites, and brand sites, which makes sense because more often than not, people who are already on a brand or retail site is there to buy. However when it comes to blogging, a good portion of blogs are indeed editorial, and they do help consumers discover new products that might not have crossed their paths. I've said this before, that brands are not completely sure what they are looking for in a successful blogger campaign. The metrics have not been established between blogger and brand, this is true. Perhaps it's time that bloggers start understanding this as part of their monetization strategy? Perhaps brands need to take this into account when working with a blogger? It's apparent that something needs to be done to close the disconnect. 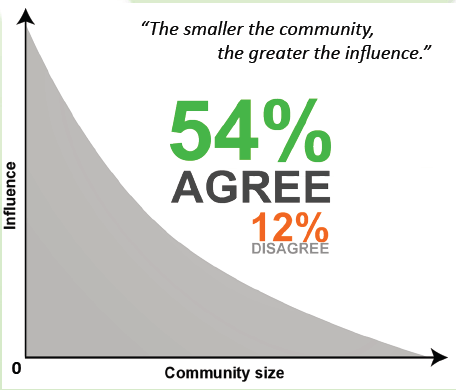 Interestingly enough, 54% of consumers believe that the smaller the community the bigger the influence. It's interesting because a lot of the brands I have talked to say they want “up and coming bloggers,” then turn around and try to get the top influences, for more of the same-old, same-old. This chart explains consumer's belief in the trustworthiness of smaller communities. Here is an example where no community should consider themselves too small to start tracking metrics. In fact, even more vital because if the consumers are being influenced by your a community, brands might overlook the conversion rates where they could possibly have even greater success. 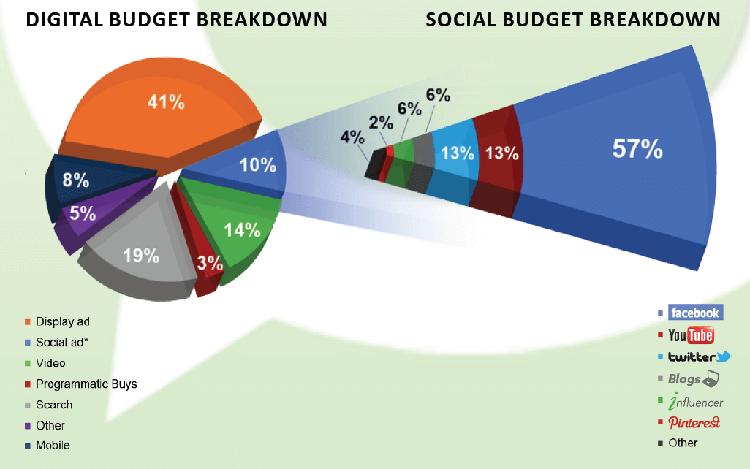 According to the report, brands are expected to increase their digital marketing budgets this year, the biggest jump will be in mobile advertising. It seems like the ball is in the blogger's court to understand how their readers engage and could possibly convert into consumers for brands. It's hard to balance this with turning out editorial content, this I know. But as a community, if understanding the business end isn't taken seriously, it will indeed be a huge missed opportunity. Ana is a Travel Blogger and Blogging Coach at The City Sidewalks. With her expertise in online marketing, she's able to help other bloggers, creatives, and entrepreneurs grow their businesses so that they can achieve financial freedom to travel the world on their own terms. Brands care about numbers, what return they get on their investment. While they do want a fresh face (the up and coming blogger), the most popular ones are those who can actually deliver a significant and a measurable return. X amount of people saw my post about product A, Y amount of people clicked through to the brand’s page, Z amount of people made a purchase. I own a boutique and that graph is the exact opposite of what I’ve experienced. Instagram is #1 for me, and fashion bloggers are dead last — I get so few sales when bloggers wear my clothing, and probably more than half of the stuff I send to bloggers never gets worn or posted on their sites. “Bigger doesn’t necessarily mean better” Yes it does. Like Milena said, sales is a numbers game. The more people who see it, the more will buy it, period. Fashion blogs in general are all the “same old, same old”. And how many brands did this “study” sample? And how big are those brands? Who is their target demo? There’s a lot of background info left out of this piece. Also, this article needs MAJOR editing/proofreading lol. Kimberly, there’s a link in the first paragraph to the full report. When trying to do a summary you typically don’t cover every single point in an original piece – that’s called plagiarism. There is some validity to the point about the size of the brands though. If you’re a single store boutique, your posts on Instagram or Pinterest could easily be a bigger driver of sales because you have a smaller, more personal inventory. If you’re a department store, with thousands of SKUs, hundreds of store locations and a massive e-commerce warehouse, you’d probably find that you need to get more people who have their own social audiences talking about you to make an impact. All of these channels “work,” but it’s a matter of testing and defining goals. Maybe your blogger marketing would work better for you if you define what you’re expecting – more Instagram followers? sales? more people coming to your boutique website? Throwing bloggers under the bus when you haven’t bothered to define “success” isn’t a fail on the bloggers’ end. Further, influence doesn’t necessarily mean last referrer. Sometimes I read about something on a website, then go to Google or the website directly for more information. I wouldn’t have done those things if I didn’t read about it on a blog/site, so the blog did influence my purchase even if Google got credit. THIS. is so important and not said enough. trouble is, you can’t measure this. and a brand’s strategy is a fail from the beginning if overall influence, engagement, followers, etc., isn’t taken at least equally to raw sales when working with a blogger. over the LONG TERM too. you’re NOT going to see results in a month. consistency is THE KEY. I so wish that smaller businesses in general got that. I don’t want to defend every social site or every blogger, because some of them are built on purchased Twitter followers and inflated numbers. BUT, marketing is not a set it and forget it activity that happens one time. Marketing that builds a business, rather than flaming out after the campaign ends is an ongoing process. Your last sentence is so, so true. I have bought so many items (primarily beauty products and books) after reading about them on various blogs. However, not once did I purchase directly after clicking on the link from the blog post, not because I have anything against the blogger, but rather because I need a period of deliberation before purchasing anything. 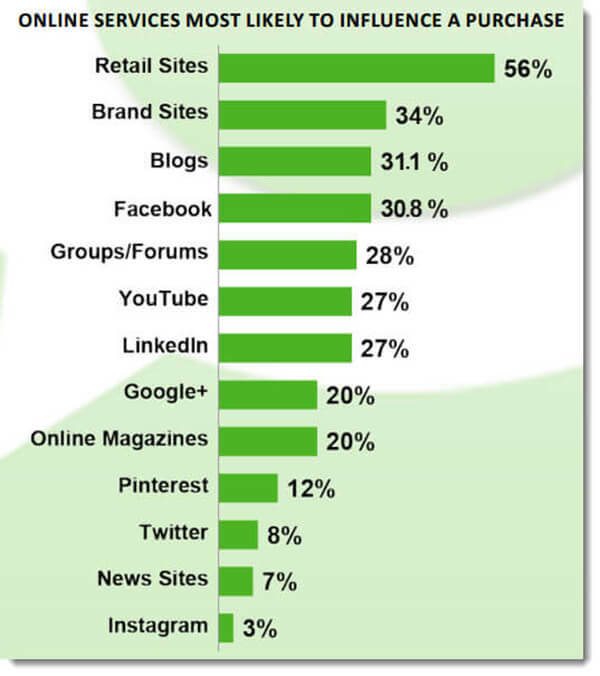 consumers and 150 top brand marketers. Maybe your blogger engagement strategy was not appropriate for your brand? Also, conversion is more important than impressions. There are a lot of sites that have loads of traffic, but don’t convert because of the type and source of traffic they have. Even more important is the audience and it’s relevance to the product. Pardon my “typos” there were two in there. Running a blog takes a lot of juggling, and the fact we moved our server today, I was more than a bit stretched. Love your article and I am sure we have an opportunity in our hands. I got my masters degree in marketing years ago and I could have never imagined all these incredible changes in consumer marketing strategies. I feel we live in exciting times. Janine, I have to disagree when you say conversion is more important than impressions. It all depends on the brand’s intent (some seek to create awareness, where others want immediate sales) and they want one or the other at different points in time and use different channels to achieve it. A site with loads of traffic is just as good as TV (not at the same scale of course), they don’t bring you immediate conversion but they do make people remember your brand or product the next time they are about to make a buying decision. If a blogger has well defined where the traffic to their site comes from and their demographics (and are really honest about it when discussing with a brand), this is when they can shine and have an advantage over other mediums. Also when discussing how smaller communities are more influential we should define small and big. Yes, what you said is true, and also, ultimately the brand is looking for conversions. They’re not going to spend money on “awareness” if it doesn’t convert eventually. From my anecdotal experience, this rings true. Looking around my closet, I can see the influence of the blogs that I love. I actually wish that *more* blogs used affiliate links so that my purchases were supporting the publishers that I adore. Also, lots of big e-commerce sites like Zara and Etsy, don’t have affiliate links, so those transactions are never counted. Heck, even providing tracking links would be an improvement. i could go on and on and on for a million years on this subject, but i’ll just try to say quickly that this article and your thoughts correspond a hundred percent to my experience over the nearly 10 years i’ve been blogging. my community is small, but my readers are buyers (my demographic is older and has more disposable income) and trust my opinion, so they buy what i post. i know this. there’s a huge difference in “fashion blogs” too – we are NOT all the same. if a blogger starts out wearing mostly thrifted pieces, then starts to wear all gifted items, because she’s got a lot of traffic/impressions, that’s not automatically going to convert for the designer or btq who’s gifting her the items- EVEN if the style is basically the same. her audience was her audience because she thrifted, not because she wore boutique-y things…they’re not going to just shift over to buying things she wears overnight, she’ll need to develop a completely new audience. Very much useful I must say. I am bookmarking it right now. As a digital media agency specialising in fashion and luxury we regularly pass on our insights on the actual role bloggers play in our clients campaigns – to that we’d certainly be happy to share what we can with Jennine and the IFB – as a follow up to this post. Subjects like this always create good debate, as I’m sure Jennine deliberately wanted. Ultimately as a few of the comments have stated it is all dependent upon the objectives of the campaign and how sophisticated the execution / analytics are. More and more brands are increasing both their activity with bloggers and also investing in time and technology to not only understand the influence but also put a value on the contribution directly and in-directly (I.e. on the wider online and offline integrated channels). As fashion online continues to grow and all parties involve stop using assumptions but actionable data – it will only provide greater opportunities and revenue. My advice to bloggers would be to work with your partners, agencies and brands to further understand your data (readership, geographical location, product-level information) plus your influence. Thanks Chris for your insight! Appreciate when we are getting advice from all angles! I know bloggers influence people to buy because I’ve bought things after seeing them on bloggers. I’ve clicked through from posts and parted with my cash. I don’t know how much my blog influences people; I do see some click-through traffic and occasionally friends tell me they ended up in the black-hole of the Topshop website for hours after I linked to a pair of shoes. I have a very small blog, I mean really small and I’ve closely followed my quantcast data and most of my reader are within my age range with a similar or close income to mine. And guess what? I do influence their purchases and I know that for a fact. Even my friends would call me when they purchased something after they saw me wearing it. keep in mind most of use live in big cities as well and don’t always follow the affiliated links. If they like my J.Crew blazer they just go to the nearest store and purchase it. And I know this well, because I’ve been following bloggers for a while now and they do influence my purchases if I love their style. I cannot tell you how many items I’ve purchase after seeing it on a blogger. I will personally say as a small business owner when a blogger does wear something from my store I receive more hits in sales within the two weeks of their post. Its also great I can track their entry point which shows me the blog they found me on. I will state that I personally buy based on what I want not what a blogger wears. It does help me to see how a real person rocks something. It all just truly depends. We are all influence regardless of what people say. I am introduced to new brands all of the time through bloggers. If I like what I see I sign up for the email list or follow on facebook or instagram. Then I am exposed to the brand’s content over and over and at some point down the line, if I like what I see, I make a purchase. Unless the brand’s CRM is very sophisticated, there is no way to give the blogger credit for that sale. Granted, I am a heavy internet, blog, e-commerce user but I do believe that this is the norm, as is evidenced by this report, especially for young women. This market is only going to grow as we online savvy shoppers age and new generations of girls seek fashion/beauty entertainment online, very exciting times! So very interesting about the smaller communities. I find that to be very true as smaller blogs seem to have more loyal followers. I manage a brand and learned early on to drop bloggers. We tested big and small bloggers, including ones who have a blog on The Age and appear on morning TV sometime. It all started with emails from bloggers we would interact with on Twitter. Each one said they loved our products and could they have some samples to write about it. Each one spoke of their influence. One – even said whenever she appears on TV with a particular fashion item, the company sells out that day. Yet her The Age blog is a ghost town and has since been dropped. When I read a little closer I noticed the majority of comments on fashion blogs are from other bloggers trying to drum up a readership for themselves. These people will be more likely to ask for free product than be potential buyers of my brand. End result? No contribution to sales, no substantial brand recognition and a lot of wasted time from this marketing channel. Also I have such a disdain for bloggers general attitude of false influence and their expectations of compensation when they add little value. I now ignore the 10 or so emails I get a week for ‘Can you send me FREE product so I can write about it on my oh-so-influential- blog’. I say, by all means blog away. Just stop trying to align yourself with brands unless you understand that you are there as value as a salesperson. The problem with affiliates in my opinion is the lack of transparency. I have to wait 90 days and even if I foster a purchase, it is quite possible someone else will it another affiliate and nullify mine. I like Consignd.com as they offer 25% commissions and have the heart of a start-up – I just wish they would add products faster.